SMS Maama Team Member, Maddy Kluesner discusses conducting focus groups at Benedict Medical Center in Kampala, Uganda. "Maternal and child health MPH student Sonja Ausen-Anifrani knew that Uganda has one of the highest maternal mortality rates in East Africa. 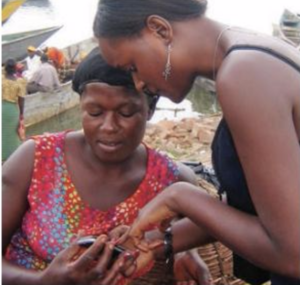 So she is working to develop SMS Maama, a text messaging service that contacts expectant mothers in Uganda with health information and health screening questions with the hopes of decreasing health complications and increasing contact with the health provider." The SMS Maama project will be implemented in partnership with the University of Minnesota and Benedict Medical Center and TMCG on the usability, feasibility and user satisfaction of an interactive and informational phone message service (SMS) aimed to promote maternal health. "Pregnancy is a natural phenomenon of the human body. Yet, have you ever paused to think about how many things have to go right in order for a mom and baby to be healthy at the end of it all?" Sonja Ausen-Anifrani believes that maternal mortality can be reduced by providing the health information that every woman deserves. As an organization, we believe every woman has the right to information and the right to receive respectful maternity care. By providing access to this necessary health information, SMS Maama works to empower women and serve as a modern addition to pregnancy healthcare in Uganda. Sonja's varied career work with immigrants brought her to the University of Minnesota School of Public Health. Katelyn was recognized as a notable recent College of Biological Sciences alum for her work both with SMS Maama and a research study investigating Cryptococcal Meningitis in people living with HIV/AIDS.